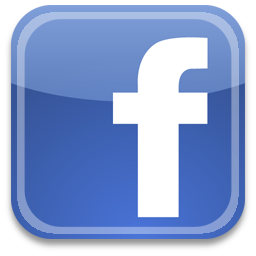 articles about skyway jumpers before this site was created. 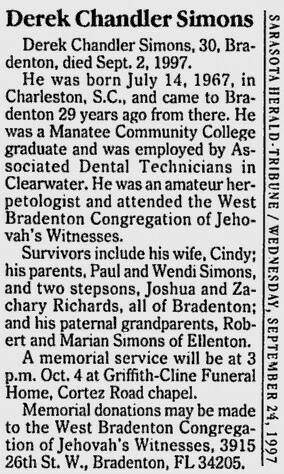 04.13.98, St. Petersburg Times, On the morning of Dec. 23, Linda Blankenship told her elderly mother she had to run an errand. Then she drove to the Sunshine Skyway and pulled over at the crest of the bridge. She got out and sat on the railing, her feet dangling over the side, 197 feet from the water. A few minutes passed. Then, Blankenship pushed off and fell to her death. She was one of eight people to commit suicide last year from the bridge linking Pinellas and Manatee counties. Already this year there have been seven more, and the increase has led to a call for better safety measures on the bridge to save lives. The family of 46-year-old Blankenship believes that jumping from the Skyway presented itself as too easy. They wonder whether her death could have been prevented. Blankenship was divorced and had lived with her mother in Gulfport for three years. Her ex-husband and two college-age children live in Georgia. A slim, neatly dressed woman in family photos, Blankenship went to therapy and took medication for depression. She volunteered at local charities. She seemed to be doing well. Perhaps she was upset that she could not give her kids lavish Christmas presents. Perhaps she had driven to the bridge to find her brother, Michael Yakes, who oversees safety at state toll plazas. Maybe she had a spontaneous impulse to jump. Her family theorizes. They will never know. But Yakes has asked his employers at the Florida Department of Transportation to study placing a barrier on the bridge's main span to prevent suicides. "It's hard to accept the death of my sister," said Yakes, who also is the mayor of Gulfport. "But I would feel better if I could prevent this from happening to some other family. I see my mother every day, and this won't go away." Yakes says he is approaching state officials as the brother of a suicide victim, rather than as a 37-year employee of the DOT or as the seven-year mayor of the small town of Gulfport. He and another engineer in the Tampa Bay Regional Toll Office, Lee Bohning, estimate it might cost the state about $20,000 to study suicide prevention on the bridge. Bohning supports Yakes as a friend, not as a state employee. Yakes finds himself among several local suicide prevention groups and law enforcement agencies who are concerned about increasing suicides from the bridge. tbo.com, Police spotted him on bridge but were unable to stop him from jumping. tbo.com, Under stress from caring for terminally ill spouse. Dave Hendley pulled his state truck to the side of the Sunshine Skyway Tuesday morning because he figured the man standing by a parked car needed help. The man, dressed in blue jeans and a shirt imprinted with the name Mark, told Hendley he was going to jump off the bridge and swung his legs over the side. Seeing the man was in his mid-30s, Hendley asked about a family. Talking about his wife and young son and daughter brought the man off the railing. tbo.com, Stood on bridge railing while police attempted to talk him down. Apparently lost balance and fell. 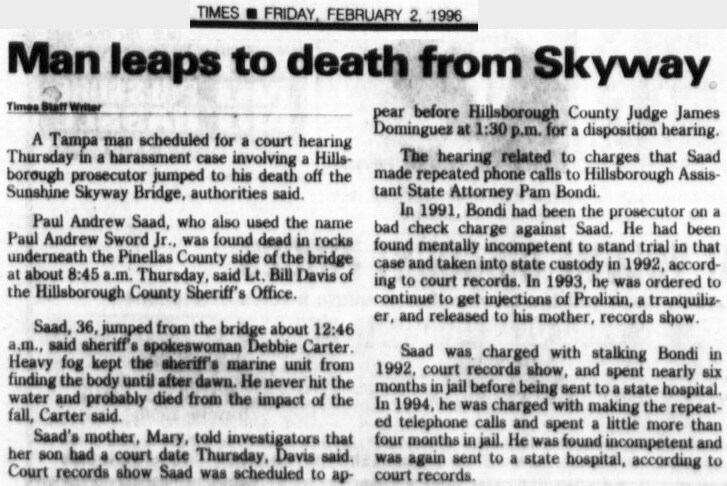 09.03.97, heraldtribune.com, DEPUTIES PROBING BODY'S DISCOVERY, Hillsborough County sheriff's deputies are investigating whether a body found Tuesday floating near the mouth of Tampa Bay is connected to a car left on the Sunshine Skyway bridge three days earlier. The car, registered to a 30-year-old Manatee County man, was found parked on the bridge Saturday with its engine running, sheriff's spokesman Lt. David Gee said. Authorities have not identified the body, recovered near the north fishing pier about 8:40 a.m.
09.06.97, heraldtribune.com, OFFICE GIVES NAME OF MISSING MAN, Hillsborough County sheriff's officials have not positively identified the man whose body was found floating near the mouth of Tampa Bay on Tuesday morning. But they are releasing the name of the 30-year-old Bradenton man whose family reported him missing a few days before the body was discovered. They say the two men are probably the same. The missing man's name is Derek Simons, 30.
tbo.com, Car found abandoned on bridge with motor running. Body found two days later. For the second time in less than 12 hours, Hillsborough sheriff's officials believe someone jumped from the center span of the Sunshine Skyway bridge. At 4:45 a.m. Friday, authorities found a 1989 Chevrolet parked at the top of the bridge, said Hillsborough sheriff's spokesman Lt. David Gee. Officials think the car's driver, Scott Clark, 17, of [address withheld] in St. Petersburg, commited suicide, Gee said. Authorities pulled a body out of Tampa Bay near the bridge about 10:30 p.m. Friday night, Hillsborough sheriff's deputies said, but there was no immediate identification. Clark's parents were notified and officials are investigating. tbo.com, Car found abandoned on bridge. Body recovered same day. 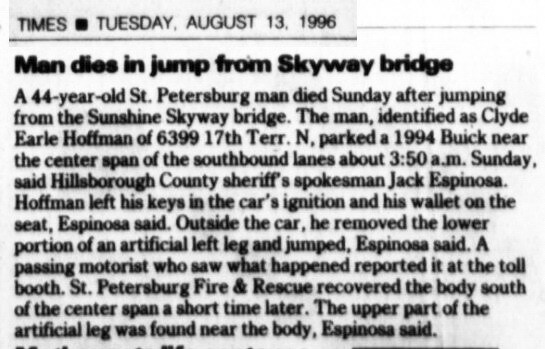 07.26.97, St. Petersburg Times, ...a 28-year-old Pasco County man parked an older model BMW near the center span and jumped to his death just after 8 p.m., Gee said. A Coast Guard helicopter later discovered his body near the Maximo boat ramp in St. Petersburg. The man's name was not released Friday because his relatives had not been notified. Gee said about six people commit suicide each year by jumping from the bridge. tbo.com, Stopped his BMW near top of southbound side of center span and jumped. TAMPA - A body pulled from Tampa Bay on Tuesday night has been identified as a Clearwater man who apparently committed suicide, Manatee sheriff's officials said. Officials with the Medical Examiner's Office found no signs of trauma to Mark Hershkowitz, 42, of [address withheld], whose body was recovered about 300 yards south of the south fishing pier of the Sunshine Skyway Bridge. A bridge toll operator contacted the Coast Guard about 1 a.m. Tuesday to report an abandoned two-door, red Cadillac parked in the northbound emergency lane near the center of the bridge. Rescuers searched for five hours and could not find the missing driver. About 7:30 p.m. people fishing near the south fishing pier saw a body in the water. Detectives determined Wednesday that Hershkowitz was the man who abandoned the car but could not say when or why he may have jumped from the bridge. A 53-year-old Tampa man killed himself Sunday by jumping from the Sunshine Skyway bridge, Hillsborough sheriff's deputies said. Michael L. Smith of Tampa, whose address was not released by deputies, left a suicide note with his wife before parking his 1991 Geo at the peak of the bridge about 2:30 p.m., deputies said. Smith is the seventh person this year to jump from the Skyway. Carol Ann Heller left no time for reaction. The Naples woman parked her white convertible Mazda along the southbound lanes of the Sunshine Skyway on Thursday afternoon, removed the keys from the ignition and jumped 197 feet to her death. She was the third Skyway jumper since last week, and the sixth this year, probably a record. As word of these deaths are carried in news reports, law enforcement officers fear the publicity will lead to more suicides. But psychologists and other mental health experts seem divided on whether such public suicides lead to more of the same. Moreover, they are largely uncertain about why some people choose to end their lives in a public and dramatic fashion. "Some people are so enamored of the reputation associated with these bridges," said Dr. Jerome Motto, a retired professor at the University of California at San Francisco who has specialized in depressive and suicidal states. "The Golden Gate bridge does have an aura about it. It gives death a setting that is impressive. It's hard to find that in ordinary circumstances." The American Association of Suicidology reports that more than half of the nation's suicide victims choose firearms as their means of dying. But in areas where there are landmark bridges such as Tampa Bay and San Francisco, the most notable suicides occur in view of the motoring public. Rick Weinberg, a psychologist and associate professor at the Florida Mental Health Institute at the University of South Florida, says accessibility is often the key. "I see the means by which one kills oneself based more on matters of convenience," Weinberg said. But he acknowledges that some suicides may hope to make a statement with their deaths. Taking an overdose of pills may be preferred by some people, while others choose to be more dramatic. The crisis-intervention hot line of Hillsborough County answers very few calls from people threatening to jump from the Skyway. But in the case of bridge jumpers, there often is no time to react. Unlike the person who inhales carbon-monoxide in a garage or threatens to use a handgun, people who jump from the Skyway usually leave no time for help to arrive. A motorist driving behind Carol Ann Heller saw the Naples woman pull to the side of the road about 1:30 p.m. Thursday. Heller, who turned 51 last July 4, hurriedly got out of her Mazda and jumped. A boater below watched her jump and radioed the Coast Guard. The motorist behind her waved down a crew in a Department of Transportation truck. But Heller died instantly, said Hillsborough County sheriff's spokesman Jack Espinosa. "It's crazy," said John Nocito, who conducts electronic surveillance along the Skyway. "Six this year is a record. It's very, very unusual." Weinberg and others worry about the effect of the news media covering the deaths of Skyway jumpers. "It might influence it. It might support - but not necessarily plant - the idea," he said. In San Francisco, where people have been known to fly from New Jersey to leap from the Golden Gate, the local newspapers no longer routinely publish statistics reflecting the number of bridge jumpers. As the record reached 499, a man wearing "500" on a sign and determined to jump was carried off the bridge by security officers. A year or so ago, the newspapers officially stopped counting jumpers at 997, but residents and bar patrons made wagers on when the 1,000th person would jump. It became part of a community dialogue. "Somehow, to be number 1,000, it would be distinguishable and go down in history," said Motto, the psychiatry professor, who believes barriers should be installed to reduce the number of suicides, similar to efforts taken at the Eiffel Tower and the Empire State Building. "It's clear in this area that the bridge has a certain aura of grandeur. It's sad, but true." A Bradenton man died Tuesday after leaping from the Sunshine Skyway, becoming the second person in three days to commit suicide by jumping from the bridge. Troy Daniel Drake, 30, was found in Tampa Bay, about 300 yards south of the bridge's center span. Hillsborough County deputies received a call about 8 a.m. saying a blue Buick was parked near the southbound lanes of traffic. The car was the independent taxi that Drake operated, deputies said. Drake, of [address withheld], died instantly, deputies said. tbo.com, Parked car on southbound side of center span, removed lower portion of artificial leg and jumped. Body recovered same day. Clyde Earle 'Skip' Hoffman Jr.
A 56-year-old Fort Myers man jumped to his death from the Sunshine Skyway Bridge Thursday afternoon, Hillsborough County sheriff's spokeswoman Debbie Carter said. About 2:15 p.m., a car was spotted seen on the southbound side of the bridge, deputies said. The man apparently committed suicide. The man's identity was not released Thursday night, pending notification of his family in Fort Myers, Carter said. tbo.com, Not available, 56, male, died, Parked rented vehicle at top of bridge, turned on flashers, got out and jumped. Body recovered same day. The body of a 36-year-old Bradenton woman was pulled from the water off the Sunshine Skyway bridge early Saturday after she apparently committed suicide, authorities said. The body of Arbutus Bare, of [address withheld], was pulled from the water at 8:15 a.m., said Hillsborough sheriff's spokesman Jack Espinosa. Bare's brown Dodge was found about 9 p.m. Friday, parked on the bridge with the keys in the trunk, Espinosa said. No note was found, Espinosa said. Joseph Harold Landfried always had a good story to tell. On Friday morning, he told one of his better ones. Having called for a taxi, the 41-year-old persuaded the driver to take him to the top of the Sunshine Skyway. He even paid him $20 toward the fare. Along the way, Landfried said he was a former Pittsburgh police officer who spent the last 18 years as a blind man after a bullet struck his teargas canister. All he really wanted now was a chance to hear the water, to feel the gulf breeze. "It didn't seem like an unreasonable request for a blind man," said Gary Robinson, the driver for Clearwater Yellow Cab. "I let him talk me into it." Within moments of Landfried stepping outside the taxi near the highest part of the Skyway, Robinson said he looked over his right shoulder to see him "topple" over the side railing. The Coast Guard later found his body in the Gulf of Mexico about 4 miles west of the bridge. Whether he meant to commit suicide or whether he simply fell remains under investigation. "This man has suffered his entire life," said his younger brother, Mark Landfried, of Ambridge, Pa. "If you only knew everything, you would be sitting here like me saying he's dead and he's in a better place." At 13, relatives say, Landfried was blinded after a teargas canister exploded within inches of his face. Although the relatives would not discuss the accident, they did say Landfried never had been a police officer in Pittsburgh. Instead, Landfried spent most of his adult life living here and there. He stayed awhile in Jacksonville, awhile in Daytona Beach. He had been in St. Petersburg maybe only a month. But he always rode in cabs. About 3:45 a.m. Friday, Yellow Cab was called to the Playmates lounge on Central Avenue in St. Petersburg. Landfried was wearing sunglasses and talking to a dancer from the club when the taxi drove up. Robinson, the driver, later told investigators that he was supposed to take his passenger to Treasure Island. But Landfried wanted to make a detour, to the Sunshine Skyway. Knowing the fare would be close $60 by the time they reached Treasure Island, Robinson insisted on receiving part of the money up front. So Landfried gave him $20. The two men talked during the drive. Landfried told him about being a former officer, about his plans for the future, about studying psychology in the past. Robinson described the Skyway to his passenger - how the lights reflected from the center span, how the lightning strikes could be seen in the distance on such a clear night. Robinson said he didn't want to stop the cab, but he agreed when Landfried insisted. When they reached the top of the Skyway, the meter showed a fare of $55.10. Stopping on the bridge is against the law. "When I said get in," Robinson recalled, "he was supposed to hop back in the cab." Landfried stepped out of the car, and there was just enough room between the cab and the concrete barrier for him. Landfried fell about 195 feet into the main channel of Tampa Bay, leaving a wooden stick where he had been standing. In the back of the taxi, investigators also found a plastic garbage bag containing a bottle of medication, a single suit of clothes and identification cards. For five hours Friday, 70-year-old Elizabeth Landfried waited at her home in New Smyrna Beach for investigators to determine whether it was indeed her son who had jumped. "The young man had a hard enough life," she said. Mark, her other son, said Landfried never regained his sight, despite several operations. His pain was never relieved, either, so he took pills to help. "As a family member, he was always positive and learned to accept his fate," Mark Landfried said. 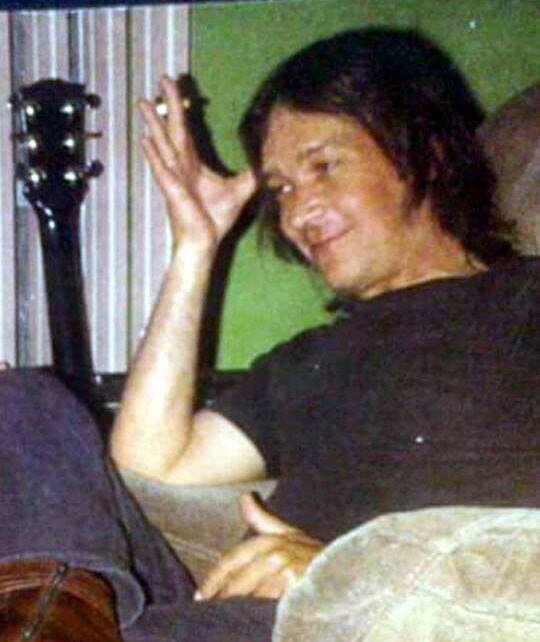 He certainly loved to talk, but his brother was not surprised to hear about what Landfried had told the cabdriver on what would be his last ride. "Joe always had a zeal for sensationalizing." A 39-year-old Largo woman parked her car on the Sunshine Skyway bridge and jumped to her death, Hillsborough sheriff's officials said. Marlena Jane Lagemann, of [address withheld], drove her 1992 Mazda to the center span just after 1 p.m. Sunday and jumped off the bridge, officials said. A witness called police. Her body was recovered minutes later by a boater, and she was pronouned dead a short time later at Bayfront Medical Center. Lagemann did not leave a note, and authorities found nothing in her car to explain the suicide. A 36-year-old man jumped from the Sunshine Skyway early Sunday after getting into a fight hours earlier with his wife, Hillsborough sheriff's officials said. Otis Gray, of [address withheld] in St. Petersburg, parked his car at the center span just after 3 a.m., said Sgt. 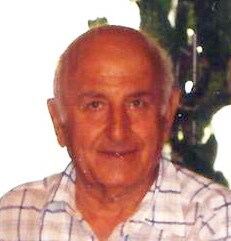 Nelson Zalva. When a passer-by stopped to see if he could help, Gray said he had problems and wanted to kill himself. He then ran and dived over the bridge, Zalva said. "They always jump off the center span because no one can survive the center span," Zalva said. Coast Guard and Florida Marine Patrol officials found his body under the Skyway about 7:30 a.m. Sunday. 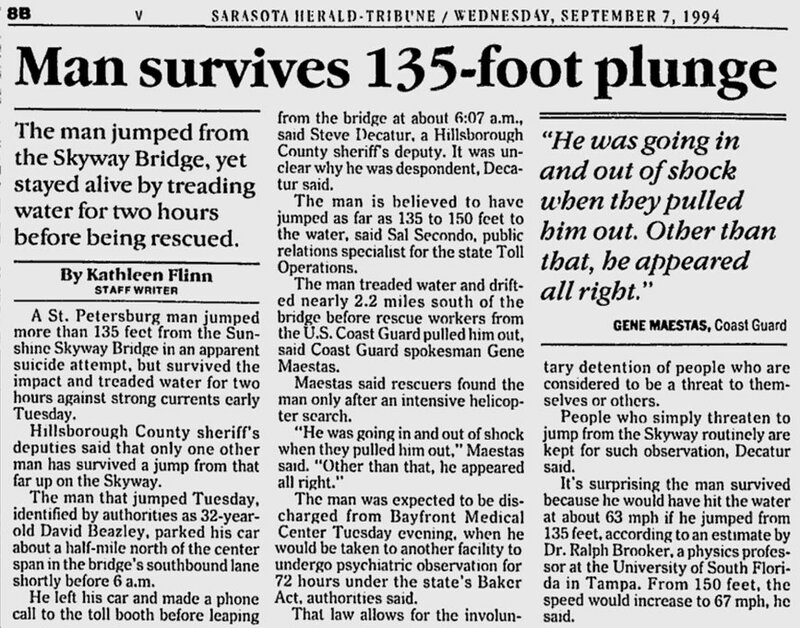 09.07.94, St. Petersburg Times, Skyway jumper survives plunge, A 32-year-old man survived a leap Tuesday from the Sunshine Skyway bridge, police said. Surveillance cameras atop the bridge saw the man as he jumped about 5:56 a.m. Tuesday. Bridge officials summoned the Coast Guard, which used boats and helicopters to rescue the man, who was taken to Bayfront Medical Center. "He was able to talk but he went into shock within seconds of being put on boat," Coast Guard Petty Officer Robert Melin said. Officials declined to identify the man. He plunged from a point about 100 feet above the water. 08.24.18, Jake C., twitter, In 94 I was fishing under the main span in a boat. Out of the corner of my eye I saw (& heard) a huge splash. I looked 200 ft up thinking something must've fallen off a truck or sum1 threw something off the bridge. It was kinda rough with rolling seas. Then, I saw a head bobbing. He started vomiting a yellow, foamy bile. Another boat pulled up and a lady yelled "give him mouth to mouth!"... Right.... He finally died right in front of us after about 5-10 minutes. tbo.com, Jumped from center span, leaving his Dodge Aries and shoes on the bridge. Passing ship spotted body. 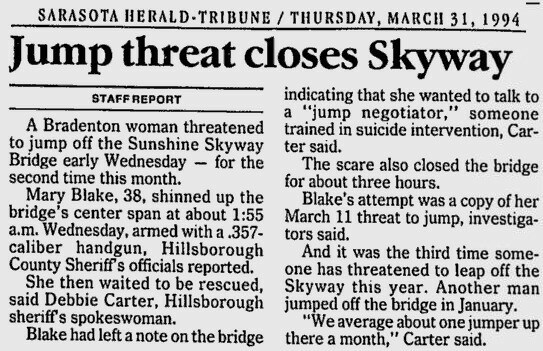 03.31.94, St. Petersburg Times, St. Petersburg; Suicide threat ties up Skyway, A woman with a .357-caliber Magnum stood on a railing of the Sunshine Skyway Bridge early Wednesday and threatened to jump into Tampa Bay, holding up traffic for more than two hours, said spokeswoman Debbie Carter for the Hillsborough County Sheriff's Office. 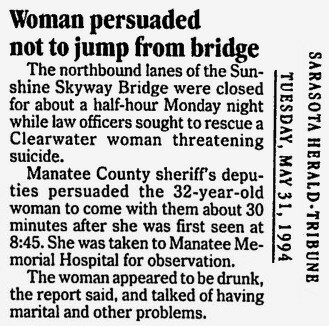 Mary Blake, 38, of Bradenton, had threatened suicide on the bridge Wednesday and once in February, Carter said. More than six police agencies came to the scene Wednesday starting about 2 a.m., Carter said. Blake was talked out of jumping off the bridge about 4:20 a.m., Carter said. Blake threw the gun in the bay before being talked down and was later referred to counseling by the Sheriff's Office, Carter said. tbo.com, Parked car on southbound side of center span, jumped. Body recovered same day. tbo.com, Body found under bridge. Car belonging to her father found on bridge. tbo.com, Seen jumping from bridge. Body found next day. Donna Marie Klein and Marc Weigel wanted their young love to be remembered. At the base of the Sunshine Skyway fishing pier Monday, one of them wrote in lipstick a memorial to their feelings - Donna Marc. The two Northeast High School students then fulfilled a lovers' pact, leaping into Tampa Bay from the Sunshine Skyway bridge, police said. Donna's body was found at the mouth of the bay about 1:20 p.m. Tuesday. Marc's body was discovered about 11 a.m. Wednesday in the main shipping channel, about 2 miles from where Donna's was found. The teenagers - Donna was 16 and Marc would have been 16 on Friday - had been dating a year and were upset that Marc's mother was sending him back to Ohio to live with his father, friends and authorities said. Donna reflected her anger in a note to her sister. "We don't really know what goes through kids' minds," said Todd St. Louis, who was Marc's football coach at St. Petersburg Catholic High until this year. "I just wish we could have helped him out somehow. I just wish if he had a problem, he would have come and talked to me." Word of the double suicide spread quickly Wednesday as Pinellas County students returned from their summer vacations. Several students sought help from school counselors, trying to understand how two young people could have ended their lives. Family members, reached at home, declined comment. "This is such a tragedy," said Stephen Driscoll, a friend of Marc's mother. Donna's mother, Barbera Klein, first became worried Monday when her daughter did not return to their northeast St. Petersburg home by an 11 p.m. curfew, said St. Petersburg police spokeswoman Michele Jones. She notified police shortly thereafter. James Falkingham was one of Marc's friends from St. Petersburg Catholic's football team. He was also one of the last people to see Marc and Donna alive. Falkingham said Marc came over to his house about 6:30 p.m. Monday. Then the two picked up Donna at her house, he said. Donna and Marc didn't seem upset while they talked and held hands. "He acted like normal," Falkingham said. "He seemed happy. I didn't see anything in him. . . . She didn't seem happy. But she didn't seem upset either." But he knew that Marc had "mentioned how he wasn't supposed to be here that much anymore. . . . He wasn't supposed to see her." Falkingham couldn't elaborate. He said Marc asked him to drive to the Skyway fishing pier. He said he refused, assuming they were going there for a party. Instead, he drove them to a convenience store at 16th Street and about 38th Avenue N so Marc could call a cab. "I dropped him off, then I left," Falkingham said, adding that he had no idea what was to follow. On Wednesday, he got the terrible news from his father. After the 11 p.m. curfew Monday, Mrs. Klein went through her daughter's room. She found a suicide note addressed to Donna's 18-year-old sister, Debi. Donna said in the note that she didn't want Marc to leave and that she was very upset with her family, authorities said. Donna also said she wanted to leave her belongings to her sister, they said. "There was no indication that either one was having trouble," said Sgt. Greg Tita, a spokesman for the Pinellas County Sheriff's Office, "Until the note was found." Mrs. Klein spoke late that night with with Marc's mother, who had last spoken to her son about 4 p.m., police said. Nothing had seemed out of the ordinary, Marc's mother told police. That night, Donna's mother and sister went looking for the two, police said. Mrs. Klein called the few friends of Donna's that she knew, and at least one of them said the teenagers had been trying to get to the Sunshine Skyway bridge. "They wouldn't tell anyone why they were going," said Jones, the police spokeswoman. Donna's sister, Debi, and a friend decided to drive to the fishing piers at both ends of the Skyway. There they discovered their first clues. Along the north pier were three messages, two on walls and one on a sign, all written with what appeared to be lipstick. Two of the messages said, "Donna Marc"; a third one said "Donna Marc." That was all they found. At 1:20 p.m. Tuesday, Coast Guard officials were called by the Harbor Island tugboat. Crew members found Donna's body floating just south of Mullet Key. Tita said her legs were broken, probably from jumping off the bridge. On Wednesday about 11 a.m., the crew of the tugboat Nebraska found a body floating in the main shipping channel just west of the Skyway. Coast Guard officials picked up the body 30 minutes later. Sheriff's deputies tentatively identified Marc through clothing and jewelry; they couldn't use dental records because he hadn't been to the dentist in St. Petersburg. Tita said deputies think he sustained head injuries from the jump. "We think they jumped from the Skyway bridge and their injuries are consistent with jumping from a high structure like a bridge," he said. "She was upset that he was being forced to go back to Cincinnati, Ohio. That's where his father lived. His mom, evidently, was forcing him to go back to Ohio. They were going to be separated." Administrators at St. Petersburg Catholic and Northeast High School were preparing for more tears today. Marilyn Brown, a spokeswoman for the Pinellas County school system, said a crisis team, counselors and other experts would be on hand to help students. "We're going to try and talk to the kids about the situation," said St. Louis, Marc's former coach. "I'm sure the student body will be devastated." Chris Jones cried for an hour after learning that the two teenagers had jumped off the Skyway Bridge in a lovers' pact. In some ways, he was shocked. But plenty of teenagers routinely talk about suicide, Jones said. "I've got a friend who tried to kill himself six times over one girl," said Jones, who will be a Northeast High School senior this year. Jones was close to Marc Weigel, the 15-year-old who jumped to his death earlier this week with his girlfriend, Donna Marie Klein. While family members mourned, Jones and other friends at Northeast High and St. Petersburg Catholic, where Weigel studied last year, spent Thursday trying to understand the tragedy. They talked, wept and tried to comfort each other. Several hundred gathered Thursday night for a memorial service at St. Raphael's Catholic Church. "I think there was a lot of confusion as to why this happened," said Father Gerald Hendry, an associate pastor who read several prayers. "We're all confused at why this should happen." One of the few clues was found in a suicide note, indicating the young couple was distraught because Marc's mother was sending him to live with his father in Ohio. "If you want to know the reason I killed myself, it is because Marc has to move to Cincinnati," Donna wrote in a note to her sister, Debi. "And I love him too much to let him go." What was particularly troubling to Jones is just as perplexing to the people who spend their lives studying teenage suicide. For years now, national figures have shown a steady increase in teenage suicide. It has become one of the top causes of death among teenagers. Marc and Donna's problems ended sometime late Monday night or early Tuesday morning. At about 6:20 p.m., authorities said, they hired a cab, rode to the Sunshine Skyway bridge and scrawled several love messages in lipstick. Then the two Northeast High juniors jumped. Donna's body was found at the mouth of Tampa Bay early Tuesday afternoon. Marc's body was discovered late Wednesday morning in the main shipping channel, about 2 miles from where Donna's was found. The two were upset and angry because Marc was being sent to live with his father in Cincinnati, friends and police said. As recently as this weekend, the issue had prompted an argument between Marc and his mother, one friend said. "He said he didn't want to go," said Chris Stevens, one of Marc's neighbors in northeast St. Petersburg. "And that's one reason he got into an argument." But the young couple's troubles must have run deeper than that, experts said. They say Marc and Donna may have suffered from a "Romeo and Juliet" fantasy. "This sounds like a classic Romeo and Juliet scene," said Dr. Alan Berman, director of the National Center for the Study and Prevention of Suicide at the Washington (D.C.) School of Psychiatry. "It's something we see more often in adulthood. Pact suicide is rare, although there aren't any statistics documenting it, said John McIntosh, president of the American Association of Suicidology. "But it has a romantic notion, dying together," said McIntosh, a psychology professor at Indiana University in South Bend. "And it sounds like a lot of the romanticism that we see in youth suicide." Suicide in general has been on the rise for years. From 1968 to 1987, the suicide rate for teenagers has increased 71 percent, McIntosh said. U.S. Department of Health and Human Services statistics for 1990 show that 12 of every 100,000 youngsters between the ages of 15 and 19 commit suicide. Some say figures could be higher because teenagers deliberately drive off bridges, crash their cars into walls and overdose on drugs, and those deaths may not be counted as suicides. Most experts blame the increase in suicide on the breakdown of the family, financial pressures that force both parents to work and the availability of drugs and alcohol. Teenagers don't have anyone to turn to or they reach out to the wrong people. "The world is a different place than it was in the '40s and '50s, when it was like Leave It to Beaver," McIntosh said. "And while I'm not a big advocate of broken families (as a cause for suicide), it lessens the number of significant others whom children can turn to in a crisis." Often, teenagers are reluctant to get help even if they know they have a problem. They cover up signs of depression. And parents often believe their children's odd behavior is no more than youthful rebellion. Youngsters who kill themselves show some obvious signs that something is wrong, said Grace Moritz, who is a project coordinator for Services to Teens at Risk in Pittsburgh. Problems can become acute if a child has to deal with the end of a relationship. The child can even become suicidal, said University of South Florida Professor Eleanor Guetzloe. "It's important that adults realize the seriousness with which children view their love relationships," said Guetzloe, who is in the special education department at USF. "These children view this as the only time they'll be in love." Warning signs of suicide Here are some of the warning signs that a teenager might be suicidal: Changes in eating and sleeping habits. Withdrawal from friends, family, activities. Violent or rebellious behavior, or running away. Drug or alcohol abuse. Changes in hygiene. Persistent boredom, difficulty concentrating, decline in schoolwork. Frequent stomachaches, headaches or fatigue. Loss of interest in pleasurable activities. Inability to accept praise. Feeling "rotten inside." Giving away favorite possessions. Verbal hints, such as "I won't see you again." Sources: USA Today, American Academy of Child and Adolescent Psychiatry. 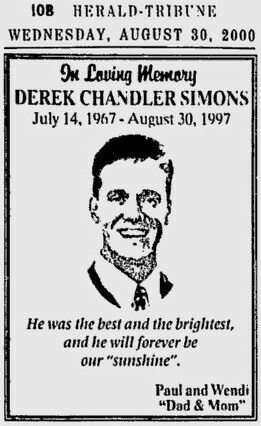 08.1994, Ethical Issues in Covering Teen Suicide Stories: Deadly Dilemmas and Fatal Flaws. detailed 34 page pdf report about the 'st. pete times' coverage of this double suicide. 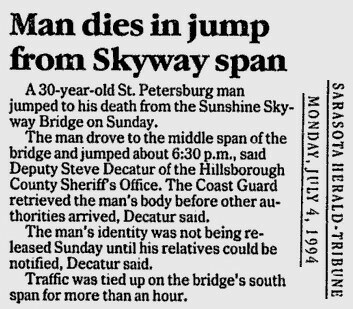 02.10.93, St. Petersburg Times, Man plunges from top of Skyway - and lives, Dressed in only a wet suit, Dean Konstantinovic parked his car at the top of the Sunshine Skyway bridge, got out and jumped. Two minutes later, a fisherman found Konstantinovic floating in Tampa Bay. Judging from the bruises on his unclad feet, he hit the water feet-first, paramedics say. Konstantinovic, 22, of Gulfport was listed in critical but stable condition late Tuesday at Bayfront Medical Center.